We have been watching a great show on PBS called Inside Nature’s Giants. A team of naturalists, biologists, and anatomists all gather to dissect large animals that have died. The dissections are interspersed with scenes following living animals, as well as cut aways to Richard Dawkins explaining the evolution of structures examined in the dissections. 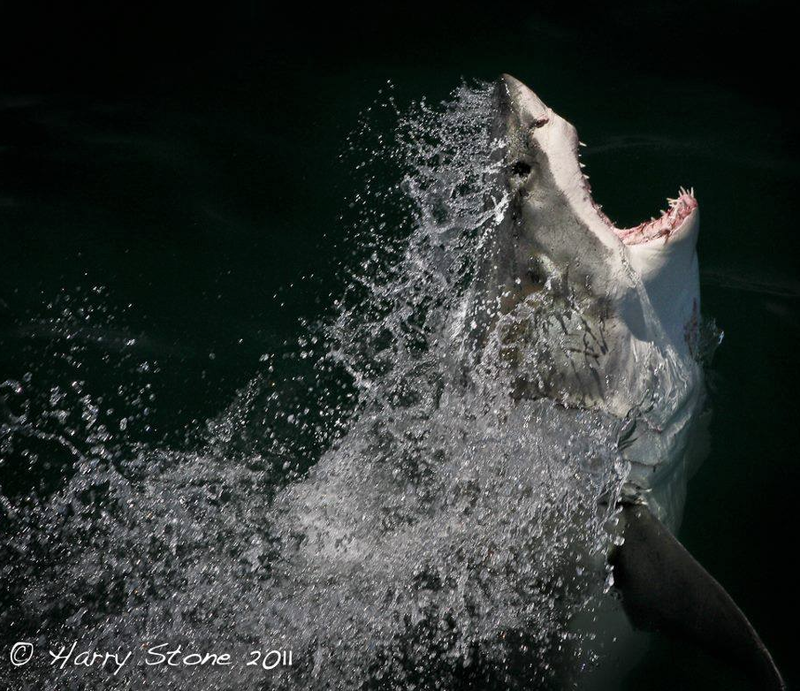 We have seen the Great White Shark, Giant Squid, Giant Python, Big Cats, and Sperm Whale episodes. Our favorite was the Great White Shark episode. 1. 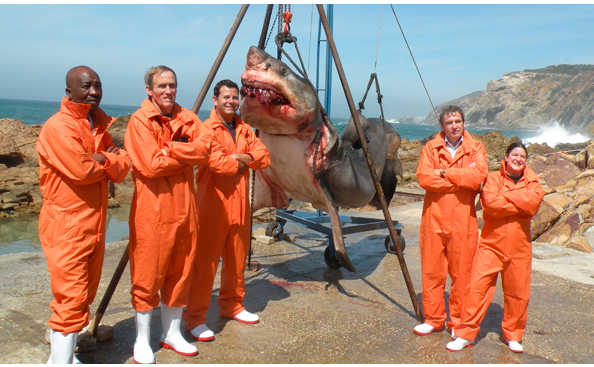 Stomach Eversion– This is a picture of the dissection team before they start cutting into the shark. 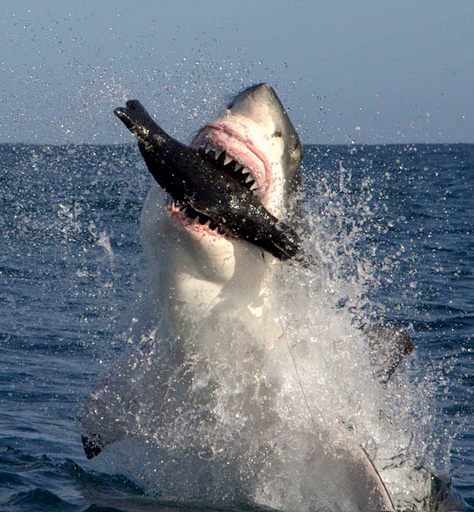 One thing that jumps out right away is the material sticking out of the shark’s mouth. 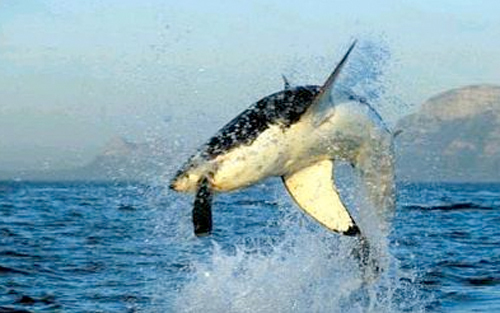 This is a really surprising fact about sharks. They can evert their stomachs! Evert means to turn inside out. It is kind of like their version of throwing up. Sharks do it when they need to get something out of their stomach that they can’t digest, like hard bone or a license plate. It can also occur in times of stress, which is probably what happened to this shark, as it drowned after it became entangled in anti-shark netting around a beach. 2. 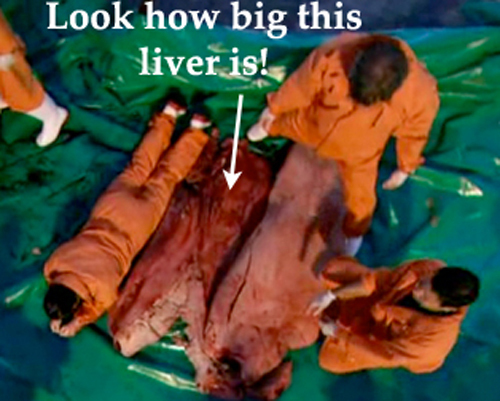 Livers – Sharks have really really big livers. And their livers float! This is because unlike bony fish (fish like goldfish, salmon, tuna), sharks don’t have swim bladders. Swim bladders are basically gas-filled sacs that allow fish to regulate where they are in the water column, they can increase or decrease their buoyancy by changing the gas inside the bladder. It helps them to go up, and to stay down! The solution sharks have come up with is to have a really big, fatty liver, which helps them to be neutrally buoyant (meaning they won’t sink or rise too much). The liver is so fatty that is actually floats when put in a bowl of water, which they demonstrated nicely on the show. 4. 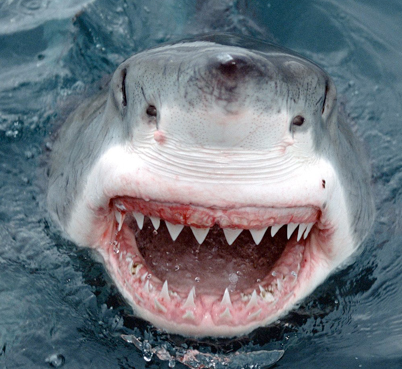 Skin – The skin of all sharks, not just Great Whites, is made of tiny teeth. 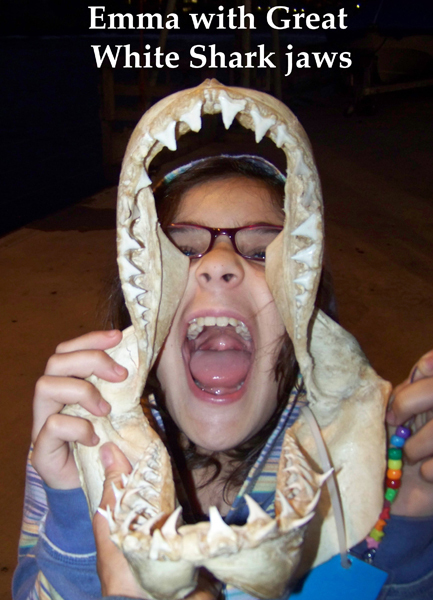 In fact, their big biting teeth evolved from their little skin teeth. 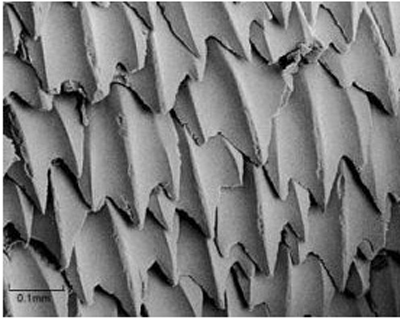 Shark skin is covered with lots of small, hard tooth-like structures called dermal denticles. These are shaped like little curved teeth, and even have the same structure as a tooth (outer layer of enamel, dentine, a central pulp cavity). That’s why shark skin feels so rough when you rub your hand against it. 5. 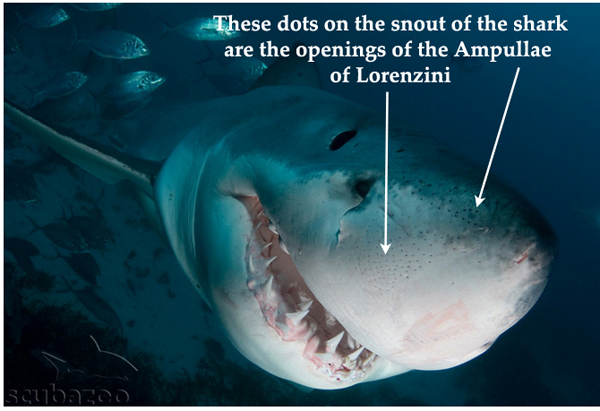 Elecromagnetic sense – Great Whites and other sharks have a whole other sense we do not, which is provided by their Ampullae of Lorenzini. 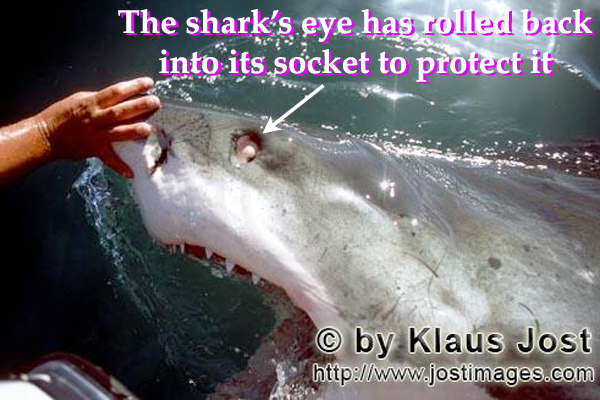 These sensory organs help the shark to sense electric fields in the water. Why would they want to sense electric fields? Living things, full of yummy blood, muscle, and fat, give off electric signals, and if the shark can sense you he can find you and eat you! The ampullae are jelly-filled canals connected to the surface of the shark’s skin by a pore, and are arranged into clusters or groups. These structures were first described by Stephano Lorenzini in 1678. It is pretty cool to have an anatomical structure named after you. Can you figure out where to find the Circle of Willis or the Islets of Langerhans in your body? This is not from the show, but is of interest to us living in San Diego. 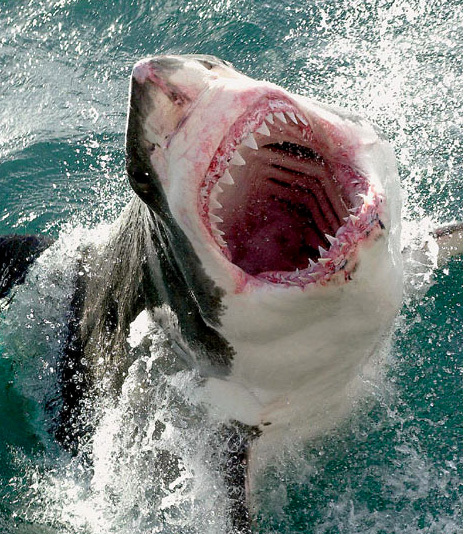 Female Great White Sharks migrate down to southern California to give birth to their young. The adults live up in northern California because there are lots of fat seals up there, which are their preferred prey. They come south to give birth in our warmer waters. The small sharks stay down here, eating fish, until they and their appetites grow enough for them to cruise up north for some seal snacks. Great Whites are spotted off of our coast, and La Jolla Shores beach was recently closed when a 15 foot Great White shark was seen by a life guard. 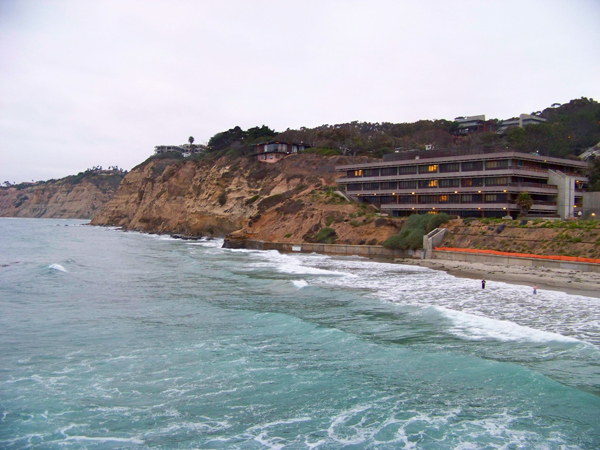 A swimmer was also killed in a Great White shark attack a few years ago a little further up the coast in Solana Beach. 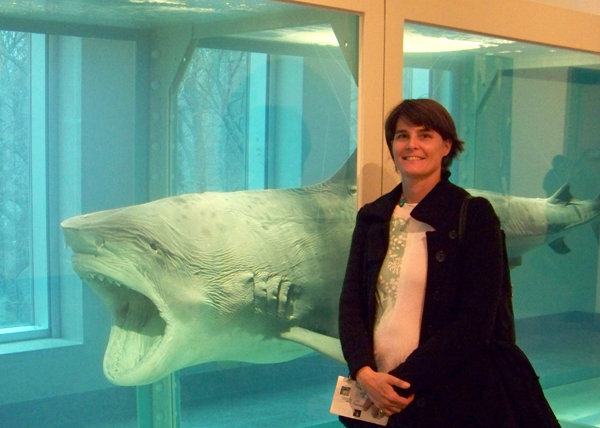 This isn’t a Great White, but it is a cool picture of me in front of The Physical Impossibility of Death in the Mind of Someone Living by Damien Hirst. It is artwork at the Met in NYC. It is a preserved Tiger Shark suspended in a formaldehyde solution. This is actually not the original shark, the first shark he used for the piece began to decay and it had to be replaced with another. This brings up the question, is the art the shark, or is the art the idea of displaying a shark and calling it art? If the original Mona Lisa decayed, would most people consider a replacement of it to be a masterpiece? 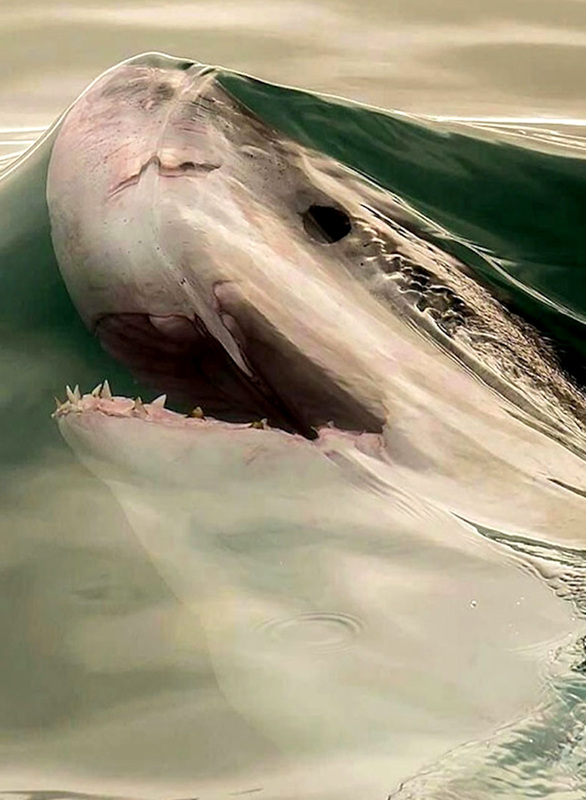 And here is an amazing photo from the web, taken at just the moment the shark is about to break through the water. Cool. And another shark all the way out of the water! We took the kids to a program offered by the Birch Aquarium at the SIO pier in La Jolla, which is normally closed to the public. 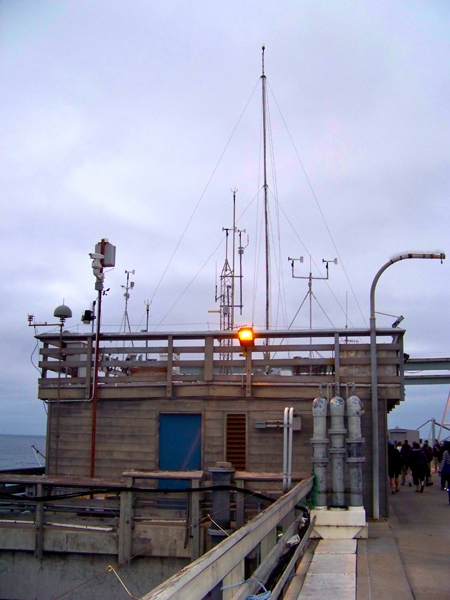 It is a working research pier used by scientists at the Scripps Institution of Oceanography (part of USCD). The program started with a tour of the campus (the new Forum building was beautiful, we want to go back there for lunch), and then we got to head out onto the pier. There were several stations set up at the end of the pier with different activities for the kids and adults to try. They tried to collect plankton with a plankton net (but the only thing they found was a fish egg), there was a table set up with various shark displays, another table housed the squid dissection, and finally there were several tubs of mussels and rocks they had collected from the sea floor, that Sam in particular spent a lot of time sifting through searching for creatures. 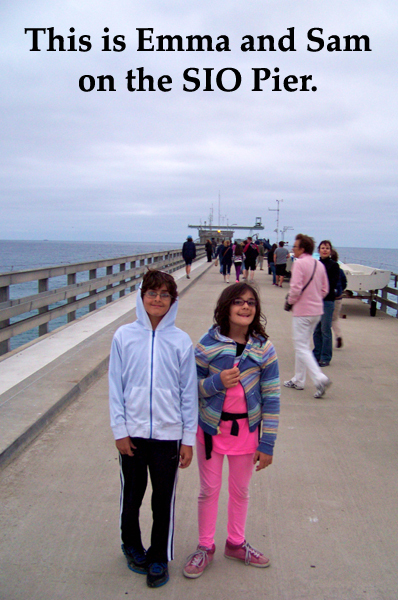 We had a great time, and I particularly enjoyed being out on the pier, looking at the view back toward the coast. The program started at 7:00, and we left around 8:30 (it got cold! 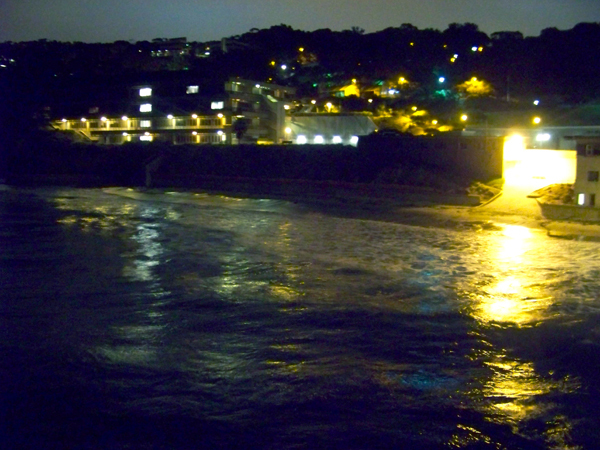 ), and the lights sparkling on the water were lovely after dark. As a special treat we were given sealed plastic baggies filled with bioluminescent plankton (dinoflagellates) that glow blue and green when you shake the baggie, called a Bioglow Kit. They should live for several months if we care for them properly (indirect sun to feed them, no extreme temperatures). The idea for the kits came from marine biologist Michael Latz of the Marine Bioluminescence Lab at SIO. 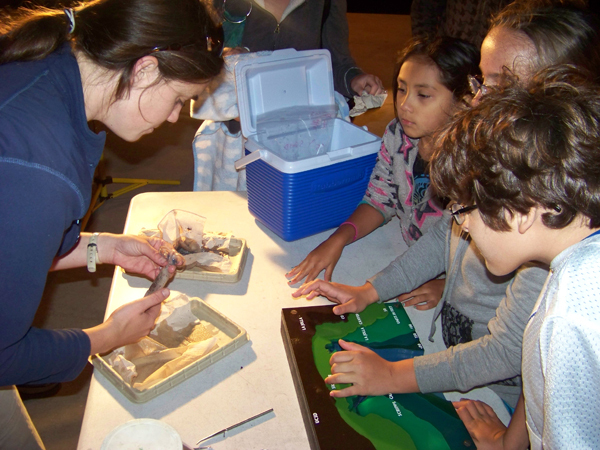 The Birch Aquarium offers this program throughout the year, it is called the Full Moon Pier Walk (the next is August 30th). We had clouds on our night, so I think we will have to try it again sometime! 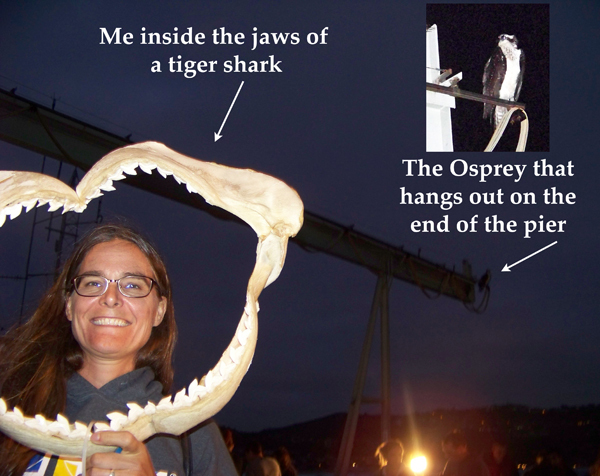 And I would recommend it if you are looking for a very San Diego outing for adults or kids with an interest in marine science. Check out Emma’s and Sam’s blogs for their posts on our outing. 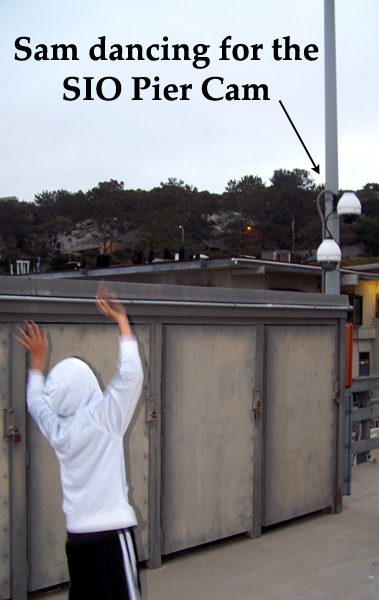 Sam dancing for the SIO pier cam. The view from the pier as we were leaving.